Barkzilla: A Savvy NYC Dog Blog: Puppy Hour Tweet Up! 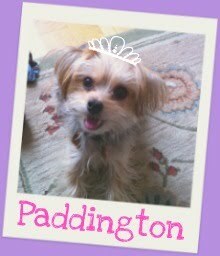 Is your dog a digital diva? 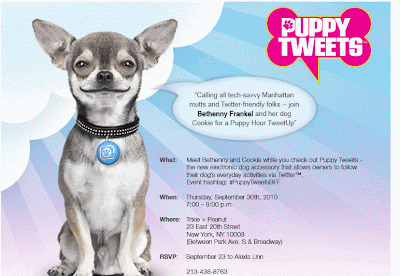 Join Bethenny Frankel (of Real Housewives of NY and Bethenny Getting Married), and her pup Cookie for a Puppy Hour TweetUp on September 30th at Trixe & Peanut (23 E. 20th St) to celebrate PuppyTweets-- a new device that tweets for your pup. That's right! PuppyTweets (kind of an awkward name, right? ), is a device that is hooked up to your dog's collar that broadcasts tweets based on their activity to Twitter via your computer. After seeing the SniffTag fail to become a huge success, we're curious to see whether this new toy will find a market.